this afternoon, I was looking at some of my old journals. I think I was trying to understand my style journey. I still don’t understand that but I just want to keep creating things I like. I have a small stack of journals that are just meh. they have no soul in them. it is hard to explain. it’s not about looks or technique…our pages give our hears away long after we have worked them. 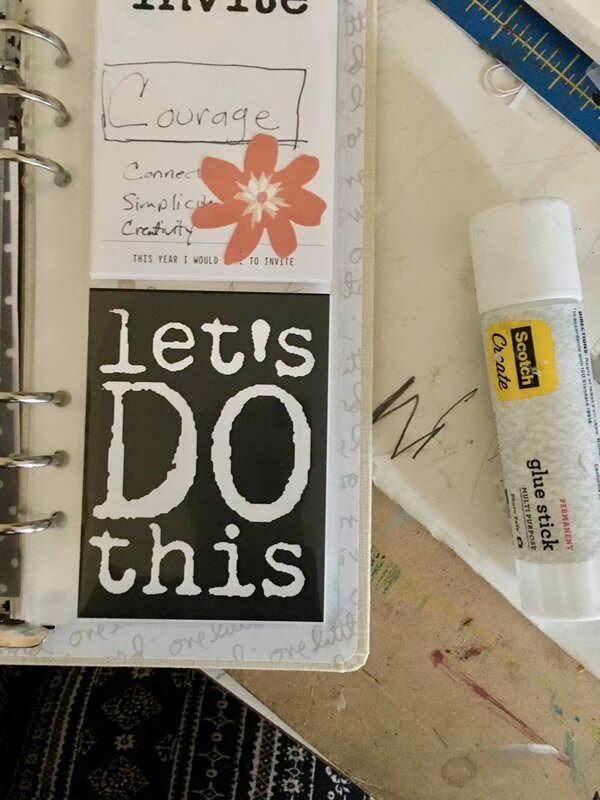 as I was looking through my old journals, I started to remember what I loved about journaling and my style of journaling….that is is wholly me. yes, I can learn from others, use bits and pieces from here and there but the way I do it speaks of my soul and journey. However , if I try to be something I am not then I get competent things with no soul. I want and need that soul and quirk. sometimes, I forget that when I want to fit in and be cool. so I step back and reclaim my mind and heart and give them back to the ONE that matters. I just want to create from that place of love and devotion…even through the hard things…that place is where my soul lives on. I really don’t set out to cover the whole page. it just happens. I love the blue and pinks. the circles, the flowers, polka dots and woman sticker ( Elaine Michelle Etsy). this process is pretty simple. I do a bit of reading. I listen to some music. In this case Jesus Culture’s 2nd album and I go with the flow. 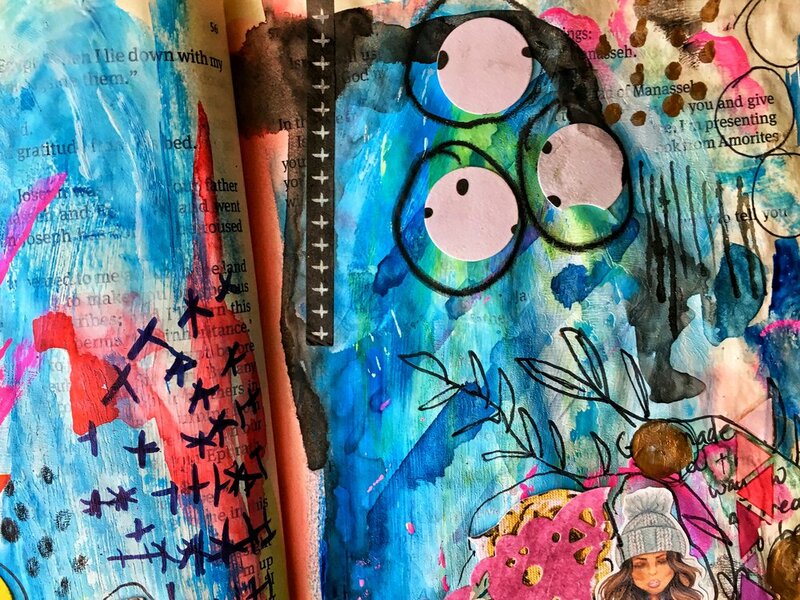 Anyways, here bits from Tim Holtz, Paige Evan and Felicity Jane spattered about, too. I ended up having to gesso these pages (liquitex professional is my favorite) because the paper is super thin. I mixed some gesso with some cobalt (art alchemy’s by finnabair). the magenta is from Dina walkley and the other colors are watercolors from various sources..probably Jane daveport. lately I am doing a lot pf scrapbooking of my kids and sketching. I have been painting more faces trying to find a happy medium between realism and cartoon. tbh I feel like during any given day I cycle thrown all the above and that is okay. I think I am met just where I am and that is always good news. I finally got around to working in my official one little word album. Initially I was just going to include it in my regular scrap/therapy albums but decided to be a little more intentional with things. I got the album, dividers and cards from Ali Edward’s website in December. Some of bits are from blinks of life, clique kits and Felicity Jane. there are still elements of scrap therapy because I really enjoy that style. I want to do more writing with the prompts but am not rushing it. Somethings just take time. Also, for ideas about how to diy your own one little word kit, I enjoyed this video. none of these are affiliated link…just things that I enjoy.